Excursions and land arrangements include some extensive walks, with some over rough surfaces. Cobblestones are used in many European cities, making walking more difficult. Access to some decks and to shore in some ports may involve steep steps. Members should be in good physical condition, able to walk a kilometre or more without assistance to fully enjoy this cruise. Waitlisted! Email Roselle to join our waitlist! Springtime in Holland, the air is clear, the fields are full of new growth and the flowers are ablaze with colour. Revel in colourful gardens, the picturesque countryside and the great cities of the Netherlands and Belgium. 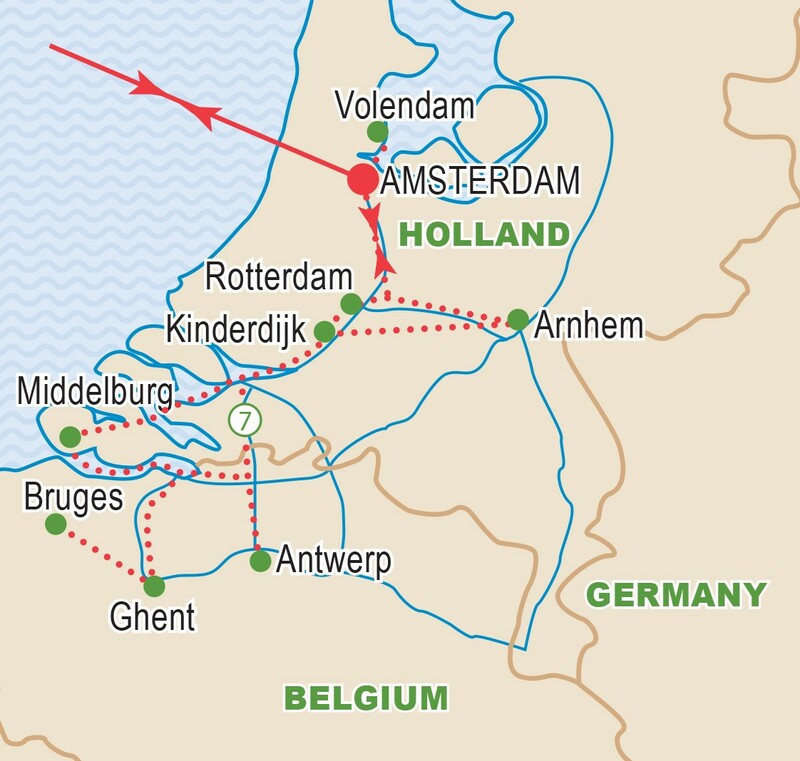 Spread across the delta region of the Rhine, the lowlands of Holland and Belgium are ideally suited to a leisurely waterways cruise. For centuries, this network of river channels, canals, and man-made lakes have been the primary means of transportation throughout the region. Our home for this special cruise will be the beautiful ms Amadeus Star, a brand new ship to be launched in 2019. Specially designed for river cruising, it is the ideal and most comfortable way to explore these waters. This unique itinerary provides a leisurely pace with ample time in the ports, which range from major cities to picturesque towns and quaint villages. And everything is included, sightseeing, meals, service charges, taxes and all tipping. This is one of our most popular river cruises with annual departures for more than a decade. Each previous cruise has filled quickly. Our space is limited and we urge you to call today to reserve your place on this delightful itinerary. Tour members from across Canada depart for the Netherlands. This morning we are introduced to this Dutch metropolis. Our sightseeing tour and canal cruise will cover some of the city’s greatest attractions. While we enjoy lunch back on board, the ship will depart for the small fishing village of Volendam. After a short stroll through the village, we will visit a local cheese factory and learn how it is made. Enjoy a walk through the quaint village of Hoorn before returning to Amsterdam where we will rejoin our ship. award for spatial media. In the afternoon, we will visit the open air museum that is home to historic houses, farmhouses and mills showcasing the Dutch life from the 18th to the 20th century. This evening we continue cruising to Middelburg. Flanders. We return to Ghent with free time to explore on our own before casting off again. Our morning will be spent on a tour of Antwerp, one of Europe’s most historic ports. Our city tour allows us to visit the Cathedral of Our Lady, Belgium’s largest Gothic church. Walk through the delightful old city centre and admire the city’s busy pedestrian ways and beautiful architecture. In the afternoon we visit picturesque Brussels, the capital of Belgium, with its lively squares, beautiful boulevards and impressive monuments including the famous ‘Manneken Pis’. This evening’s highlight will be the Captain’s Gala dinner. This morning at Kinderdijk, we visit the largest group of 18th century windmills in Holland. Later, enjoy an excursion passing the bulb fields between Haarlem and Leiden to the famous Keukenhof Garden with its spectacular display of flowers in bloom. Keukenhof also offers several ponds, sculpture gardens, greenhouses, a windmill open for inspection and several terraces for relaxing. We rejoin our ship in Rotterdam before cruising back to Amsterdam. All too soon our journey through the Dutch waterways draws to a close as we say ‘tot ziens’ (good day) to our new found friends and board our return flights to Canada. The beautiful ms Amadeus Star will be launched in 2019 and will fit perfectly with the traditional elegance of the Amadeus cruise line fleet. Similar to the ms Amadeus Queen, it will cruise the delightful waters of Holland and Belgium. With 70 cabins (188 sq. ft.) and 12 suites (284 sq. ft.), the ms Amadeus Star will carry passengers in spacious comfort. Purpose-built to sail the safe scenic waters of Europe’s rivers, she will have three decks with cabins and public rooms plus a spacious Sun Deck for viewing the countryside. All cabins will be outside, each featuring twin beds which can convert to a large bed, a private bathroom with shower, telephone, TV and air conditioning (the ship operates on 220 volts). Cabins on Haydn Deck (lowest) have a picture window while cabins on Strauss and Mozart Decks have full height glass patio doors that open creating a French Balcony. On the Haydn Deck you will also find a hair salon and massage area. On the Strauss Deck is the Restaurant, Reception, fitness room and on board shop. On Mozart Deck you will find a Panorama Bar and Lounge area. The open Sun Deck features deck chairs, a Lido Bar, chessboards and a shuffleboard. The ship is a non-smoking environment, except for some areas on the Sun Deck (subject to change). There is a small elevator on the ship which serves Strauss, Mozart and Haydn Decks. Rates are per person based on sharing a Cat C4 Outside Twin on Haydn Deck.Stateroom categories are subject to availability at time of booking. Book early for best choice. See Deck Plan for full details on various categories available. Singles are extremely limited. Please ask for rates. Cruise price is based on sharing a twin-bedded stateroom with private bathroom. Prices are based a minimum 20 members and on rates, taxes, and fees effective March 2018 and are subject to change due to factors beyond our control. This river cruise will be escorted with a minimum of 20 travellers. Prices DO NOT INCLUDE the cost of insurance which is available and is highly recommended. Premiums vary with the cost, length of the trip, and the traveller’s age. For passengers up to and including 74 years on departure date, premiums will range from $211 to $348 pp plus applicable taxes. Cost supplements for travellers aged 75-85 will range from $177 to $366 pp plus applicable taxes. This insurance is effective from the date of purchase and carries limitations on pre-existing medical conditions. Please discuss your insurance coverage prior to booking. Please refer to our Terms and Conditions for more information.